A Fourth of July barbecue is the perfect time to serve your friends some unique dishes. Instead of the usual fare, surprise them with a selection of foods made with edible flowers! Take a look at some recipes that will bring a dash of color and fragrance to your refreshment table. Give your party guests a thrill by putting a new twist on traditional favorites. Serve scoops of lavender ice cream in a collection of frosted bowls. No Fourth of July celebration is complete without this delicious treat. I like to watch the surprised faces of my guests as I serve them this fragrant alternative to the old standbys! Fresh mint brownies are also a fun option for all of the chocolate-lovers at your party. 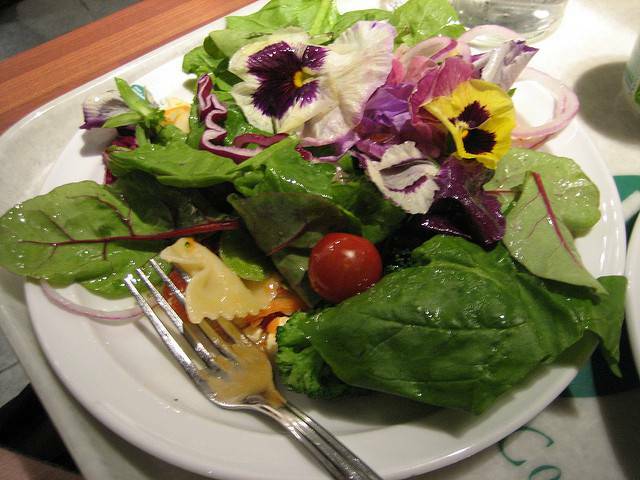 A flowery salad is a quick and easy dish for your refreshment table. Combine cucumber slices, sugar snap peas, chervil sprigs, radishes, tomato slices, black pepper, and Romaine lettuce in a bowl with some olive oil and rice vinegar. Wash pansy, carnation, or nasturtium petals and include them in the mixture. Depending on the blossoms you choose, you could end up with one colorful bowl of salad! If you want to give your guests something a little fancy this Independence Day, try making snapdragon bruschetta. First, gather some colorful snapdragons. Then, toast some baguette slices. In a bowl, mix cream cheese, black olive tapenade, lemon juice, and parsley. Estimate the ingredient amounts according to how many slices you plan to make. Carefully put about 1 teaspoon of filling in each snapdragon blossom. Place one filled snapdragon blossom on each slice of toast. Forgo the traditional French fries and serve elderflower fritters at your July Fourth party this year. The cinnamon and sugar give this dish a little dash of sweetness! Another idea is pizza with flower toppings. Just imagine serving a pizza with nasturtium flowers sprinkled across the delicious melting mozzarella cheese. Dandelion syrup is an appealing choice if you plan to serve biscuits at your gathering. First, fill a large saucepan with 4 cups of water. Next, add 4 cups of dandelion petals, one vanilla bean, and 3 slices of lemon (each 1/4-inch thick) to the water. Boil the mixture, remove it from the heat, and let it sit for six hours. Then, pour the mixture through a piece of cheesecloth into another saucepan. Bring the mixture to a low boil while adding 2 1/8 cups of granulated white sugar. Stir in the sugar, allowing it to dissolve. Let the mixture simmer until it takes on the consistency of syrup. This may take a few hours. Hibiscus punch is a sweet and simple refreshment that your guests are sure to love. Pour 4 quarts of water into a large pot and add 2 cups of dried hibiscus flower pods. Put a lid on the pot and let it stand for 2 hours. Next, take the lid off and bring the mixture to a full boil. Reduce the heat and let simmer for 8 minutes. Pour the mixture through a sieve into a pitcher. Add 2 cups of sugar to the pitcher while stirring. Chill in the refrigerator, and enjoy this delightful drink over crushed ice. Those are just a handful of dishes made with edible flowers. Try looking for ways to make your dishes more colorful with flowers throughout the year. Cheers!